On February 20, 1835, eight days after his 26th birthday, a young Englishman was resting in a woodland near Valdivia, Chile, when the ground began to heave, making him “almost giddy: it was something like…a person skating over thin ice, which bends under the weight of his body.” What he felt was a devastating earthquake, one of many to shake this region then and now. His observations of the effects of the earthquake became the bedrock for how he thought about nature and altered his future. The young man was Charles Darwin, who was then entering the fourth year of the voyage of H.M.S. Beagle. Before he set sail on the Beagle, Darwin had studied under several well-known naturalists and geologists at Cambridge, most notably John Stevens Henslow, Professor (first) of Mineralogy and later Botany, and Adam Sedgewick, Woodwardian Professor of Geology. Darwin and Sedgewick had even completed a geological survey of North Wales the year before Darwin left. Both Henslow and Sedgewick were also ordained ministers in the Church of England. The Anglican tradition taught that God could be known through “two books”, Scripture and Creation as detailed in the Book of Nature. Natural history was then considered an appropriate occupation for the clergy. The exemplar of the naturalist-clergyman was Gilbert White, a country parson who published, in 1789, the classic Natural History and Antiquities of Selbourne, his parish. When Darwin left England on the Beagle, he had planned to study for the ministry upon his return and to then settle into a quiet life in a country parsonage where he could study natural history, shoot grouse, and hunt foxes on horseback in exchange for giving a sermon on Sundays and visiting parishioners as they required. A gentlemanly and slightly scholarly but sporting life awaited his return. Or so he thought. During the first several years after leaving England, the Beagle had been surveying the east coast of South America. Darwin, being seasick when on board, would ask to be put off at various ports to explore and then later rejoin the Beagle when it sailed on. During these sojourns from the ship, he would explore the countryside, collecting and describing plants, beetles, rocks, and fossils. Darwin became overawed by the beauty of the tropical rain forest, crying “Hosanna!” in one famous passage in his diary. He made a few important scientific discoveries, to be sure. He described for the first time and in a workmanlike way the stratigraphy of the island of St. Jago, a mid-Atlantic island that was an important stop for ships crossing the ocean. On the Argentinian coast near Bahia Blanca, he excavated the fossil of an extinct giant mammal which he first thought was a Megatherium (a giant ground sloth). He also wondered, but came to no firm conclusion, about how some unknown geological force could have tilted the vast and tabletop flat Argentinian grasslands eastward toward the Atlantic. When we wasn’t doing all this, he was enjoying himself smoking cigars, riding with the gouchos, and writing home that he had become “un grand galopeador”. When not riding with the gauchos, Darwin had been reading Charles Lyell’s Principles of Geology, which Henslow urged him to buy and take along but “on no account accept the views therein advocated.” (In fact, it was Robert FitzRoy, Captain of the Beagle, who gave this book to Darwin as an expression of friendship shortly after the Beagle disembarked). Building on previous work by James Hutton and John Playfair, two important members of the circle of thinkers later known as the Scottish Enlightenment, Lyell urged geologists to see the processes that shaped the earth as always operating at about the same rate in the past as they do today. This became known as the principle of uniformitarianism. Although today’s geologists do not take this principle as strictly as Lyell intended, it remains one of the foundations of modern geology. A corollary of uniformitarianism is that the earth’s surface changes gradually over very long periods of time rather than by very large and catastrophic changes during short periods – mountains are lifted up in small increments over many, many eons rather than appearing suddenly as if they were created all at once. This was controversial, partly because it implied that the earth is much, much older than that calculated by Archbishop Ussher from all the generations of people listed in the Bible (plus 7 days of Creation – about 6,000 years in all), but also because no one had any way of measuring the rate of uplift. Although Darwin absorbed Lyell like a sponge, there is no indication in his journals up to this point that indicates a readiness to abandon the parsonage for the life of a scientist like Lyell, Henslow, or Sedgewick. Although he didn’t realize it at the time, the 1835 earthquake tilted not only the ground upon which Darwin stood but also the course of the rest of his life. His observations of the earthquake and his subsequent ascension of the Andes Mountains are described in Chapters XIV to XVI of The Voyage of the Beagle, the chapters immediately preceding the Galápagos chapter. I began to think of the importance of these chapters to Darwin’s thinking when, while teaching a senior course in Classic Readings in Natural History in 2010, there was an earthquake in the same region of Chile on February 27, 175 years almost to the day after Darwin’s earthquake. We were scheduled to begin reading the Galápagos and Coral Reefs chapters from The Voyage, but I quickly adjusted the syllabus to include the earthquake and Andes chapters as well. Although I had read The Voyage several times before, reading these chapters again immediately after the 2010 earthquake hit me like a bolt of lightning. The thought occurred to me that Darwin’s experiences in these chapters may have been the most important part of the voyage for him. What! Not the Galápagos Chapter? I hear you say. Heresy! These are the chapters in which Darwin began to think and behave like a scientist instead of a collector of natural history objects, months before he set foot on the Galápagos Islands. These are the most observation- and data-rich chapters in The Voyage, far richer than the Galápagos chapter. Darwin had a foreboding of things to come when, on January 19, he watched the Osorno volcano erupt while the Beagle sailed past on its way north to Valdivia. A few days after becoming giddy in the earthquake at Valdivia, he was at Concepción, where he witnessed the effects of a tsunami that pushed large boulders high on the beach. On land, Darwin saw that the ground was cracked into fissures a yard or more wide and trending NW-SE. Walls of buildings that trended in the same direction were thrown to the ground, whereas walls that trended NE-SW remained standing. Darwin deduced from these observations that the undulations from the earthquake began somewhere in the sea to the southwest away from the coastal waters. Perhaps most importantly, Darwin saw the shoreline raised 10 ft. above the high water mark in many places in the Bay of Concepción, lifting mussels and other molluscs and seaweed with it. In the next two chapters he climbed to the summit of the Andes (Chapter XV), returning by another route (Chapter XVI). During this climb, Darwin saw numerous raised beaches with entire molluscan communities (described in detail in his later book, Geological Observations of South America) atop thin layers of organic debris, presumably the decayed remains of seaweeds. Four of these molluscs were new species later named for Darwin. 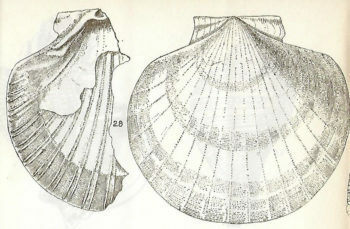 As he climbed to successively higher beaches, Darwin noted that the fossil molluscs were progressively more weathered. This showed that the beaches became older the higher they were, implying that incremental uplifts happened many times during the formation of the Andes. As the Beagle sailed north to Peru and Ecuador, Darwin made the same observations of raised beaches all along the flank of the Andes, thus demonstrating that similar process of incremental, gradual uplift were responsible for the formation of the entire mountain chain and not just the area east of Valdivia and Concepción. Later, in his book Geological Observations, Darwin drew cross-sections through the Andes, linking what he saw on his climb on the western flank of the Andes with his geological notes from the Patagonian grasslands to the east. Before Darwin’s observations, geologists such as Hutton, Lyell, and others inferred the uplift of land masses from the presence of marine fossils high atop mountains in the Scottish Highlands and elsewhere. Darwin himself inferred uplift of the land from his stratigraphic descriptions of St. Jago. These inferences were not universally accepted – other geologists pointed out that catastrophic floods such as Noah’s would have placed marine fossils atop mountains. But here, for perhaps the first time, a reasonably well-trained naturalist actually saw the uplift of land during an earthquake and documented in precise detail not only how it happened but also similar raised beaches high on the sides of an entire mountain range. Although he didn’t say this explicitly, Darwin’s writing in these chapters seems to imply that he knew he was making a major contribution to geology. When Darwin stood on a beach raised 10 feet above sea level and then looked eastward to a 7,000 foot mountain range with numerous successively raised beaches up its flanks, he not only saw but literally felt in the soles of his feet that big effects (a mountain range) can happen gradually from numerous, relatively small, incremental changes (raised beaches) over long periods of time. In a geological point of view, it is of the highest importance thus to find three great phenomena, – a submarine outburst, a period of renewed activity through many habitual vents, and a permanent elevation of the land, – forming parts of one action, and being the effects of one great cause, modified only by local circumstances. That great cause we now know to be plate tectonics, the shifting and subducting of one plate under another as they move across the spherical surface of the earth. South America off the Chilean coast is where the Nazca plate to the west collides with and is subducted beneath the westward moving South America plate to the east. We now know that the grinding of these two plates against each other is the cause of the earthquakes, the volcanoes, and the elevation of the Andes; in fact, this is the classic example of the collision of plates of the earth’s crust. What Darwin didn’t realize, but we now know, is that vertical uplift of the crust into mountain ranges is caused by the slow horizontal movements of the earth’s plates. As the Nazca plate is subducted beneath the crust of the South America plate, it forms a very deep trench – Darwin even noted the “profound” depth of the ocean floor off the coast of Chile. From this and from Darwin’s other observations, it is tempting, with considerable hindsight, to think that he comes very close to the theory of plate tectonics, a theory that didn’t take hold until the 1960s and early 1970s, the time when I was an undergraduate geology major. Of course, the data needed to support this theory was not available to Darwin. But one can only think that Darwin would be pleased to learn of this revolution in geology which provided the “great cause” in his speculation. From these chapters forward, Darwin’s writing became less concerned with travelogue and good times on horseback and more concerned with how the earth works. Increasingly, he saw himself more as a scientist with original contributions to make rather than as a naturalist/collector bound for a parsonage. He was not simply making observations and sending samples home, but imaginatively synthesizing these observations into a larger theory. These observations and syntheses supported Lyell’s ideas, and Darwin by this time had become Lyell’s de facto student. Later, as the Beagle sailed west to the South Pacific after leaving the Galápagos, Darwin turned his thoughts to coral reefs. Lyell had hypothesized that coral atolls formed on the rim of submerged volcanoes. Here, Darwin began to question his mentor. First, he turned Lyell’s principle of uniformitarianism against him by noting that no current volcano has a crater as wide as some of these coral reefs, which could be many tens of miles in diameter. Second, Darwin pointed out that corals grow only in a narrow range of depths below the sea surface. Darwin then asked: why should these volcanoes rise only to that depth where corals could grow? Darwin then departed from Lyell’s ideas and posed a new, and ultimately correct, theory. He took his clue from the elevation of the Andes which he had just left and wondered whether parts of the earth subside as other parts are elevated. Darwin proposed that corals grow atop the dead remains of former generations as the volcano supporting them subside. This implies two things. First, the current thin fringe of live coral must be growing on the dead remains of corals many thousands of feet thick and which were killed as the subsiding volcano dragged them below the depths where they were viable. The many soundings that the Beagle made when it arrived at the coral atolls supported this prediction. Second, in order for the coral reef to remain alive at its uppermost surface, the subsidence of the volcano must match the growth of corals, which is on the order of a few centimeters per year. Once again, small incremental changes (subsidence of the volcanoes and growth of corals) yield large effects (coral reefs over the South Pacific and Indian Oceans) over long periods of time. This progression of Darwin’s views reflects those of successful graduate students today: first, make observations that show your advisor that you have technical ability (collecting fossils and stratigraphic sections), then synthesize observations into a bigger picture that supports your advisor’s ideas (document uplift by observing raised beaches after an earthquake and up the flanks of a mountain range), then make new observations that go against (or at least well beyond) your advisor’s ideas and which establish you as an independent thinker (the formation of coral reefs). The voyage of the H.M.S. Beagle was Darwin’s graduate school and his three technical books from the voyage, Volcanic Islands, Geological Observations on South America, and Coral Reefs, constituted his doctoral thesis. Every scientist holds deeply held ways of looking at the world that are the wellsprings of his or her hypotheses or theories. Gerald Holton calls these themata. Big effects from small increments acting gradually over long periods of time becomes Darwin’s core thema for the rest of his geological and biological work right through to his last book, On the Formation of Mould by the Actions of Earthworms. This is the thema underlying The Origin of Species: small changes in adaptations that are transmitted to the next generations while being filtered through natural selection result in entirely new species over long periods of time. Darwin’s idea of natural selection did not start in the Andes, but the foundation for it was laid there even as the foundation of the earth shook beneath his feet and made him giddy. Throughout his life, Darwin stuck by this core thema even though his friend Thomas Henry Huxley advised him that small, gradual changes were not required for his theory of natural selection to be correct. He even stuck by it after Lord Kelvin, England’s and perhaps the world’s foremost physicist, claimed that given its presumed rate of cooling from an initially hot ball of magma, the earth could not be older than 20 – 100 million years old. This was not nearly enough time for the diversity of life to have evolved by natural selection of incremental changes in adaptations. Darwin admitted that, if Kelvin was correct, then his entire theory would have to be rejected but still sticks by his conclusions and hopes that future geological investigations will show that the earth is indeed very much older than Kelvin thought. The later discovery of the heat produced by radioactive elements dispersed through the volume of the earth was sufficient to keep the earth from cooling as fast as Kelvin thought, indeed implying that the earth was much older. The same radioactive elements have since been used to date the age of the earth at 4.5 billion years, plenty of time for the slow and gradual pace of evolution required by natural selection. Sometimes, it is important to stick to your most deeply held ways of seeing so long as they continue to produce constructive hypotheses. Throughout all his books, Darwin’s gradualism continued to give him great insight into how nature works. But were it not for the earthquake in Chile eight days after his 26th birthday, Darwin may have settled in that country parsonage after all, recording the natural history of his parish and perhaps writing The Voyage of the Beagle but never getting started on The Origin of Species. Darwin, C. 1838. On the connexion of certain volcanic phenomena in South America; and on the formation of mountain chains and volcanos, as the effect of the same power by which continents are elevated. Reprinted in pages 53-86 in P.H. Barret, editor. The Collected Papers of Charles Darwin. University of Chicago Press. Darwin, C. 1876. Geological Observations on the Volcanic Islands and Parts of South America. D. Appleton & Co., London and New York. Herbert, S. 2005. Charles Darwin, Geologist. Cornell University Press. Holton, G. 1988. Thematic Origins of Scientific Thought. Harvard University Press.